Megadeth playing live in London in 2018. From left to right: David Ellefson, Dirk Verbeuren, Dave Mustaine, and Kiko Loureiro. Megadeth is an American heavy metal band from Los Angeles, California. Guitarist Dave Mustaine and bassist David Ellefson formed the band in 1983 shortly after Mustaine's dismissal from Metallica. Along with Metallica, Anthrax, and Slayer, Megadeth is one of the "Big Four" of American thrash metal, responsible for its development and popularization. Their music features complex arrangements and fast rhythm sections, and lyrical themes of death, war, politics, and religion. 1986–1987: Peace Sells... but Who's Buying? 1988–1989: So Far, So Good... So What! In 1985, Megadeth released its debut album, Killing Is My Business... and Business Is Good! , on the independent record label Combat Records, to moderate success. It caught the attention of bigger labels, which led to Megadeth signing with Capitol Records. Their first major-label album, Peace Sells... but Who's Buying? , was released in 1986 and influenced the underground metal scene. Substance abuse and personal disputes brought Megadeth negative publicity during this period. Killing Is My Business... and Business Is Good! is the debut studio album by American thrash metal band Megadeth, released on June 12, 1985 by Combat Records. At the beginning of 1985, the band was given $8,000 by Combat to record and produce its debut album. The band was forced to fire their original producer and produce the album by themselves, after spending half of the album's budget on drugs, alcohol, and food. Despite the resulting poor production, the album was a well-received effort that obtained strong reviews in various music publications. Killing Is My Business... and Business Is Good! played an essential role in establishing thrash metal as an authentic subgenre of heavy metal music. It explores themes of death, occultism, and violence. Combat Records was an American independent record label from New York City. The label was home to predominantly heavy metal and punk rock acts including Megadeth, Circle Jerks, Nuclear Assault, OZ, Death, Dead Brain Cells, Possessed, Crumbsuckers, Agnostic Front, Agent Steel, Dark Angel, Heathen, Zoetrope and Exodus. In 2017, it was announced that Combat was being relaunched by Megadeth bassist David Ellefson and Thom Hazaert as a new label imprint under their EMP Label Group. After the lineup stabilized, Megadeth released a number of platinum-selling albums, including Rust in Peace (1990) and Countdown to Extinction (1992). These albums, along with worldwide tours, brought them public recognition. 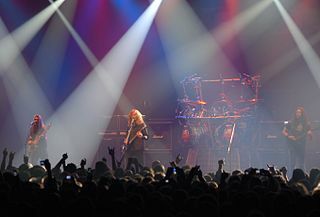 The band temporarily disbanded in 2002 when Mustaine suffered an arm injury and re-established in 2004 without bassist Ellefson, who had taken legal action against Mustaine. Ellefson settled out of court and rejoined in 2010. Megadeth has hosted its own music festival, Gigantour, several times since July 2005. Rust in Peace is the fourth studio album by American thrash metal band Megadeth, released on September 24, 1990 by Capitol Records. 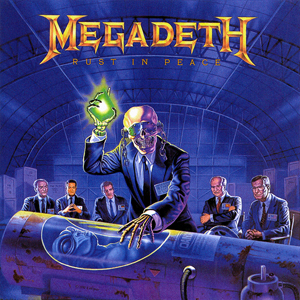 Following the departure of band members Jeff Young and Chuck Behler in 1989, Rust in Peace was the first album to feature guitarist Marty Friedman and drummer Nick Menza. Rust in Peace received universal acclaim from fans and critics, and was responsible for bringing Megadeth to the attention of a mainstream metal audience. It has been cited as one of the best thrash metal records of all time by publications such as Decibel and Kerrang!, and listed as one of the 1001 Albums You Must Hear Before You Die. The album was nominated for a Grammy Award for Best Metal Performance at the 33rd Grammy Awards. At the 1991 Foundations Forum, it won a Concrete Foundations Award for Top Radio Album and the single Hangar 18 won Top Radio Cut. Countdown to Extinction is the fifth studio album by American thrash metal band Megadeth, released on July 14, 1992, through Capitol Records. It was the group's second studio release to feature the "classic" lineup of Dave Mustaine, Marty Friedman, David Ellefson and Nick Menza, with all of them contributing to songwriting on the album. 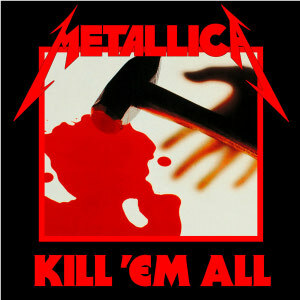 The album features some of the band's best known songs such as "Symphony of Destruction", "Sweating Bullets", and "Skin o' My Teeth", which enjoyed significant chart success and made a great musical impact. Gigantour was a sporadically organised traveling heavy metal music festival organized by Megadeth's Dave Mustaine. The tour was founded in 2005 with dates across North America, and the 2006 and 2007 line-ups also traveled to Australia. The bands appearing at the festival were chosen by Mustaine. The tour is set as an alternative to tours such as Ozzfest. The name "Gigantour" was inspired by the classic 1960s anime Gigantor. The most recent Gigantour took place in 2013. Megadeth has sold over 38 million records worldwide,  earned platinum certification in the United States for five of its fifteen studio albums,  and received twelve Grammy nominations. Megadeth won its first Grammy Award in 2017 for the song "Dystopia" in the Best Metal Performance category. The band's mascot, Vic Rattlehead, regularly appears on album artwork and live shows. The group has drawn controversy for its music and lyrics, including album bans and canceled concerts; MTV refused to play two of the band's music videos that the network considered to condone suicide. David Scott Mustaine is an American guitarist, singer, songwriter, actor and author. He is best known as the co-founder, lead vocalist, guitarist and primary songwriter of the American heavy metal band Megadeth, as well as the original lead guitarist of the American band Metallica. David Warren Ellefson is an American bassist, co-founder and second-longest serving member of the American heavy metal band Megadeth from 1983 to 2002 and again from 2010. He has also been referred to as "Junior" to differentiate him from his bandmate Dave Mustaine, but does not go by this name professionally. Ellefson currently resides in Scottsdale, Arizona. In addition to playing bass guitar in Megadeth, Ellefson also has various side projects which include Temple of Brutality, F5, Killing Machine and Metal Allegiance. In music, metre refers to the regularly recurring patterns and accents such as bars and beats. Unlike rhythm, metric onsets are not necessarily sounded, but are nevertheless expected by the listener. Vic Rattlehead next to Dave Mustaine on stage in 2018. Megadeth's logo first appeared on its second album, and has featured on all its recordings since. Megadeth performing at the Sloss Furnaces in Birmingham, Alabama on July 17, 1991. Mustaine dissolved Megadeth in 2002, following an arm injury that prevented him from playing guitar. James LoMenzo was Megadeth's bassist from 2006 to 2010. Guitarist Chris Broderick joined Megadeth in 2008, replacing Glen Drover. David Ellefson and Dave Mustaine performing at the Norway Rock Festival in July 2010. Shawn Drover and Chris Broderick sign autographs aboard the Los Angeles-class attack submarine USS Helena (SSN-725). Drummer Dirk Verbeuren joined the band in 2016, replacing Chris Adler. Kiko Loureiro (right) playing live with Dave Mustaine in 2018. On April 6, 2018, the band announced a re-issue of Killing Is My Business... And Business is Good! containing remastered versions of all songs and a re-cut version of "These Boots" being lyrically adjusted to Hazlewood's version, bonus discs also included rare live performances of songs off the album during Alice Cooper's Live in the Flesh Tour. The re-issued album, Killing Is My Business... and Business Is Good! – The Final Kill, was released on June 8, 2018. For a more comprehensive list, see List of awards and nominations received by Megadeth. 2016: Silver Winner - "The Megadeth VR Experience"
2011: Metal Song of the Year – "Public Enemy No. 1"
So Far, So Good... So What! is the third studio album by American thrash metal band Megadeth, released on January 19, 1988 by Capitol Records. It was the band's only album recorded with drummer Chuck Behler and guitarist Jeff Young, both of whom were fired immediately after its subsequent tour. So Far, So Good... So What! features music performed at fast tempos with technical ability; lyrically, frontman and guitarist Dave Mustaine addresses a variety of topics, including nuclear holocaust and freedom of speech. Cryptic Writings is the seventh studio album by American thrash metal band Megadeth. Released on June 17, 1997 through Capitol Records, it was the band's last studio album to feature drummer Nick Menza. His departure would mark the end of the band's longest lasting lineup to date, having recorded four studio albums. Megadeth decided to produce the record with Dann Huff in Nashville, Tennessee, because they were not satisfied with their previous producer Max Norman. The album features 12 tracks with accessible song structures, specifically aimed for radio airplay. The lyrics were also altered, in order to make the music more inclusive for wider audience. These changes were met with mixed opinions from music critics, who noted the band moving away from their thrash metal roots. 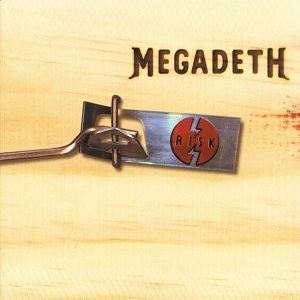 Risk is the eighth studio album by American thrash metal band Megadeth, released on August 31, 1999 by Capitol Records, the band's last album to be released by the label. The first Megadeth album since 1990 to feature a lineup change, Risk marks the studio debut of drummer Jimmy DeGrasso with the band, as well as the final appearance of longtime guitarist Marty Friedman, who announced his departure a year later. Meant to be a breakthrough on alternative rock radio, Risk received a mixed response because of the great deviation from the band's traditional sound. The backlash ultimately resulted with the band returning towards a heavier sound with its next album. 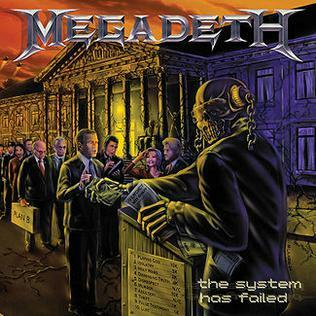 The System Has Failed is the tenth studio album by American thrash metal band Megadeth, released on September 14, 2004. It was the band's second and final studio album to be distributed by Sanctuary Records. The System Has Failed was the first album to be released after Mustaine recovered from his arm injury sustained in 2002 which prevented him from playing guitar. It is also the first of three Megadeth records not to include original bassist and co-founder David Ellefson. Instead, the album features session players, including former Megadeth guitarist Chris Poland on lead guitar. However, Poland only provided lead guitar parts and solos on a contractual basis and did not rejoin the band. To date, it is the only Megadeth album where the only certified member of the band was Mustaine. As a result, it is occasionally referred to as a Mustaine solo album. Shawn Drover is a Canadian musician, best known for his work with the American heavy metal band Megadeth. American thrash metal band Megadeth has released fifteen studio albums, five live albums, six compilation albums, one EP, forty-nine singles, ten video albums, and forty-four music videos. 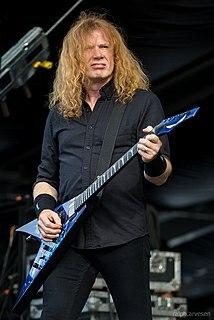 After he was fired from Metallica in 1983, guitarist and vocalist Dave Mustaine formed Megadeth along with bassist Dave Ellefson, guitarist Greg Handevidt, and drummer Dijon Carruthers. The band toured and gained a following, signing with the independent label Combat Records in late 1984. 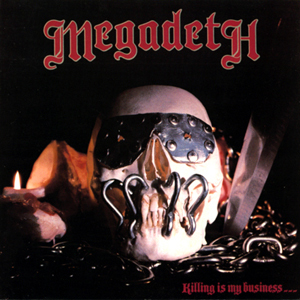 Megadeth's debut album Killing Is My Business... and Business Is Good! (1985), sold very well for an independent release, and the group attracted the attention of major record labels. By the end of the year, the group signed with Capitol Records. Megadeth's first major-label album, Peace Sells... but Who's Buying?, was released in 1986. Endgame is the twelfth studio album by American thrash metal band Megadeth. It was produced by Dave Mustaine and Andy Sneap and released through Roadrunner Records on September 15, 2009. Endgame was the first album to feature guitarist Chris Broderick, following Glen Drover's departure in 2008, and was the band's last studio album with bassist James LoMenzo; original bassist David Ellefson rejoined the band several months after the album's release. 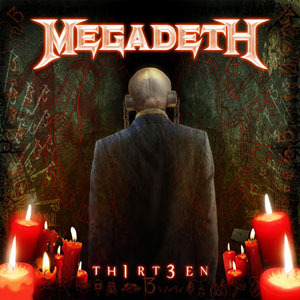 Th1rt3en is the thirteenth studio album by American thrash metal band Megadeth. It was released worldwide on November 1, 2011, by Roadrunner Records, although the album was released on October 26, 2011 for Japan. Thirteen is the first Megadeth studio album since The World Needs a Hero (2001) to feature bassist and founding member David Ellefson, who returned to the band in 2010. Th1rt3en debuted at number 11 on the Billboard 200 chart, selling 42,000 copies in its first week. The album broke into the top 20 in several other markets as well. It has sold about 120,000 copies in the United States as of December 2012. The album has received largely positive reviews from critics. "Public Enemy No. 1" is a song by the American heavy metal band Megadeth, written by Dave Mustaine. It is the first single and second track from their thirteenth studio album Thirteen, which was released on November 1, 2011. The song was commercially released as a single on September 13, 2011, which was Mustaine's 50th birthday. A music video for the song was released on November 5, 2011. 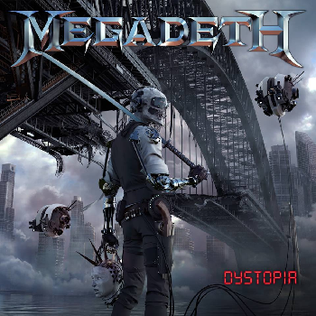 Dystopia is the fifteenth studio album by American thrash metal band Megadeth. It was released on frontman and guitarist Dave Mustaine's Tradecraft label via Universal on January 22, 2016. The album was produced by Mustaine and Chris Rakestraw and features cover artwork by Brent Elliot White. ↑ Ingle, Laura (December 19, 2016). "Megadeth's Dave Mustaine: "I'd like to Win" a Grammy for 'Dystopia'". Fox News Radio . Retrieved January 20, 2018. 1 2 3 "American album certifications – Megadeth". Recording Industry Association of America . Retrieved March 19, 2019. If necessary, click Advanced, then click Format, then select Album, then click SEARCH. 1 2 3 4 "Megadeth". GRAMMY.com. March 17, 2014. Retrieved January 31, 2019. ↑ Mustaine 2010, p. 101. ↑ Gulla 2009, p. 101. 1 2 Wagner 2010, p. 42. ↑ Mustaine 2011, p. 87. ↑ Summers, Jodi Beth (June 1987). "Out to Lunch". Hit Parader . Rockmetal.art.pl. Retrieved November 15, 2013. 1 2 3 Prown & Newquist 1997, p. 227. 1 2 3 Doe, Bernard (December 1985). "Megadeth – Love It To Death". Metal Forces . Retrieved November 13, 2013. ↑ Mustaine 2011, p. 124. ↑ Ellefson & McIver 2013, p. 53. ↑ Ellefson & McIver 2013, p. 55. ↑ Bukszpan 2003, p. 242. ↑ McIver 2008, Chapter 7. ↑ "Megadeth: The Making Of The New 'Vic Rattlehead' Mask". Blabbermouth.net. October 2, 2012. Retrieved March 6, 2013. ↑ Hart, Josh (August 15, 2011). "Dave Mustaine on Early Days With Metallica: "I Had Always Called Us the 'Four Horsemen'"". Revolver . Guitar World . Retrieved November 16, 2013. ↑ Killing Is My Business... and Business Is Good! liner notes (2002 reissue). Loud Records. 2002. p. 8. 1 2 Begrand, Adrien (April 30, 2002). "Megadeth: Killing is My Business... and Business is Good!". PopMatters . Retrieved November 16, 2013. ↑ Ellefson & McIver 2013, pp. 55–56. 1 2 Ellefson & McIver 2013, p. 58. ↑ Pett, Sukey (March 1987). "Peace, Love, And Megadeth". Spin (12): 14. Retrieved July 6, 2014. ↑ Moore 2009, p. 102. ↑ Kot, Greg (August 15, 2010). "Megadeth's Dave Mustaine says he and Metallica have hugged out". Chicago Tribune . Retrieved November 17, 2013. ↑ Tarquin 2012, p. 72. ↑ Konow 2009, p. 243. ↑ Matsumoto, Jon (October 16, 1986). "Megadeth: These Heavy Metalers Thrash For Peace". Los Angeles Times . Retrieved November 15, 2013. ↑ Talevski 2010, p. 570. ↑ Ellefson & McIver 2013, p. 61. ↑ Stern, Lauren (August 6, 2012). "Megadeth – Best Band Logos". Loudwire . Retrieved July 7, 2014. 1 2 Popson, Tom (February 6, 1987). "Megadeth Hed To Go Here". Chicago Tribune . Retrieved November 15, 2013. 1 2 3 Rees & Crampton 1999, p. 658. 1 2 Konow 2009, p. 244. 1 2 Gomes, Celesete (August 1988). 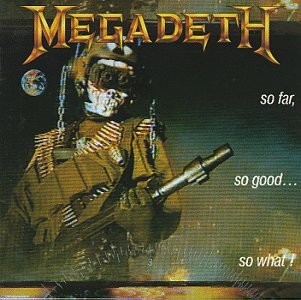 "So Far, So Good For Megadeth". Classic Rock . Rockmetal.art.pl. Retrieved November 8, 2013. ↑ So Far, So Good... So What! (2004 reissue) (liner notes). Capitol Records. 2004. p. 2. ↑ Ellefson & McIver 2013, p. 71. ↑ Christgau, Robert (1987). "Consumer Guide Reviews". The Village Voice . Retrieved December 6, 2013. ↑ Rees & Crampton 1999, p. 546. 1 2 3 Bukszpan 2003, p. 244. ↑ Unterberger & Hicks 1999, p. 416. ↑ Spheeris, Penelope (2005). Greatest Hits: Back to the Start (liner notes). Capitol Records. p. 2. ↑ Megadeth: Rusted Pieces VHS. Capitol Records/EMI. January 1, 1991. ↑ Ellefson & McIver 2013, p. 72. ↑ Niles, Eric (September 1990). "Rust in Peace". Music Connection . Rockmetal.art.pl. Retrieved December 8, 2013. ↑ Kajzer & Lotring 2010, p. 192. ↑ Dome, Malcolm (December 21, 2009). "Megadeth Bitching: Mustaine And Young At War!". Classic Rock . Archived from the original on December 11, 2013. Retrieved December 8, 2013. ↑ Buckley 2003, p. 660. ↑ Janosik 2006, p. 97. ↑ Willems, Steven (December 4, 2000). "Interview With Dark Angel". Voices From The Dark Side. Retrieved March 7, 2014. ↑ Ellefson & McIver 2013, p. 79. 1 2 "Dave Mustaine: Kerry King Hates My Guts". Blabbermouth.net . Ultimate-Guitar.com. August 16, 2013. Retrieved November 18, 2013. ↑ "A Look Back at Savatage's Criss Oliva". All That Shreds Magazine . April 8, 2017. Retrieved December 31, 2018. ↑ "Guitarist Jeff Loomis-"If I Had Joined Megadeth". BraveWords . July 3, 2010. Retrieved December 31, 2018. 1 2 "Megadeth "Rust in Peace"". Decibel . Retrieved December 8, 2013. ↑ Ellefson & McIver 2013, p. 88. ↑ Kajzer & Lotring 2010, p. 320. 1 2 Bienstock, Richard (September 17, 2010). "Megadeth: Rust Never Sleeps". Guitar World . Retrieved November 22, 2013. ↑ Rubiner 1993, p. 167. 1 2 3 "Megadeth – Chart History (Albums)". Billboard . Retrieved December 4, 2013. ↑ "Chart Stats – Megadeth". Chart Stats. Retrieved February 24, 2013. 1 2 Pillsbury 2006, p. 82. ↑ "Megadeth: First Look At 'Rust In Peace Live' DVD". Blabbermouth.net. August 23, 2010. Retrieved December 8, 2013. ↑ Morris, Chris (January 14, 1995). "Ace Of Base, 'Lion King' Lead Record Certs". Billboard : 76. Retrieved December 8, 2013. ↑ McIver 2008, Chapter 13. 1 2 Harrison 2011, p. 60. ↑ Ellefson & McIver 2013, p. 101. ↑ Popoff 2002, p. 108. ↑ Countdown to Extinction liner notes (Japanese edition). Capitol Records. 1992. pp. 3–5, 7–8, 10. ↑ Herrmann, Brenda (July 30, 1992). 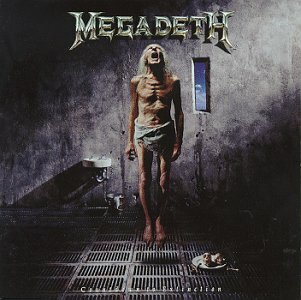 "Megadeth – Countdown to Extinction (Capitol)". Chicago Tribune . Retrieved December 8, 2013. ↑ Prince, Patrick (November 19, 2012). "Megadeth fully embraces "Countdown" anniversary". Goldmine . Retrieved November 17, 2013. ↑ Ellefson & McIver 2013, p. 103. 1 2 Joyner 2002, p. 301. 1 2 3 Erlewine, Stephen Thomas. "Megadeth Biography". AllMusic . Retrieved November 15, 2013. ↑ MacDonald, Patrick (January 8, 1993). "Grammys show influence of Seattle music". The Seattle Times . Retrieved December 17, 2009. ↑ Grow, Kory (September 13, 2012). "Megadeth – Countdown To Extinction 20th Anniversary Edition Cover Art Shown In New York's Times Square". Brave Words & Bloody Knuckles . Retrieved November 17, 2013. 1 2 3 Ellefson & McIver 2013, p. 106. ↑ Chirazi, Steffan (October 1993). "Trial by Fire". RIP. Rockmetal.art.pl. Retrieved December 8, 2013. ↑ Ramirez, Carlos. "10 Most Underrated Megadeth Songs". Noisecreep . Retrieved November 24, 2013. ↑ Hartmann, Graham (April 2, 2014). "Megadeth's David Ellefson Plays 'Wikipedia: Fact or Fiction?'". Loudwire . Retrieved May 25, 2014. ↑ Spin staff (October 1993). "Clash of the Quasi-Titans". Spin . 9: 36. Retrieved November 18, 2013. ↑ Harris, Chris (January 29, 2010). "The Grammys Don't Understand Metal". Noisecreep . Retrieved December 8, 2013. ↑ MacDonald, Patrick (January 5, 1996). "Presidents of the U.S. are riding high in the musical polls". The Seattle Times . Retrieved December 17, 2009. ↑ Larkin 1995, p. 2777. ↑ Youthanasia liner notes (2004 reissue). Capitol Records. 2004. pp. 2, 24–25. 1 2 Ellefson & McIver 2013, p. 118. ↑ Erlewine, Stephen Thomas. "Megadeth: Youthanasia". AllMusic . Retrieved December 8, 2013. ↑ "Megadeth: Evolver – Making of Youthanasia (1995)". The New York Times . Retrieved December 9, 2013. ↑ Nielsen Business Media, Inc (November 19, 1994). "Billboard 200". Billboard : 88. Retrieved December 9, 2013. ↑ "Canadian album certifications – Megadeth – Youthanasia". Music Canada. Archived from the original on December 12, 2013. Retrieved December 9, 2013. ↑ Merkle, P.J. 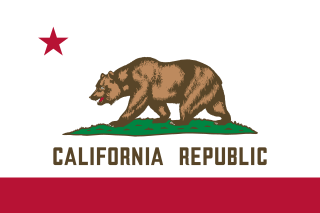 (May 1995). "Megadeth: Bewitched, Bothered and Bewildered". Hit Parader . Rockmetal.art.pl. Retrieved September 16, 2013. ↑ "Late Show With David Letterman: Episode Guide". MSN Entertainment. November 18, 1994. Retrieved July 17, 2014. ↑ Menza, Nick. "When Megadeth Needed a Drummer". Nick Menza's Official Website. Archived from the original on July 27, 2014. Retrieved July 18, 2014. ↑ "The Killing Road – A History Of Megadeth's Opening Acts". Roadrunner Records. February 2, 2012. Retrieved December 9, 2013. 1 2 3 "History". Megadeth.com. Retrieved December 9, 2013. ↑ Henderson, Alex. "Tales from the Crypt: Demon Knight (Original Soundtrack)". AllMusic . Retrieved December 9, 2013. ↑ Golemis, Dean (November 9, 1995). 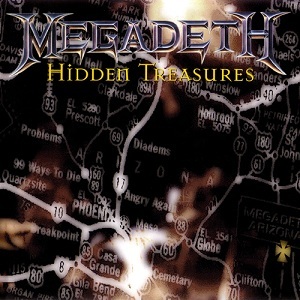 "Megadeth: Hidden Treasures (Capitol)". Chicago Tribune . Retrieved December 11, 2013. ↑ Prato, Greg. "MD.45 – Biography". AllMusic . Retrieved December 10, 2013. 1 2 Wiederhorn, Jon (June 1998). "Last Men Standing". Guitar World . Rockmetal.art.pl. Retrieved December 10, 2013. ↑ Ellefson & McIver 2013, p. 129. ↑ Cryptic Writings liner notes (2004 reissue). Capitol Records. 2004. pp. 2–3. ↑ Mustaine 2011, p. 275. ↑ "Megadeth – Chart History (Songs) – second page". Billboard . Retrieved December 10, 2013. ↑ Billboard staff (January 17, 1998). "40th Annual Grammy Awards: Final Nominations". Billboard : 78. Retrieved December 10, 2013. ↑ "Cryptic Writings – Megadeth – Charts". AllMusic . Retrieved December 10, 2013. ↑ Masuo, Sandy (June 29, 1997). "In Brief: Megadeth, "Cryptic Writing," Capitol". Los Angeles Times . Retrieved December 10, 2013. ↑ Metal Sludge staff (March 12, 2002). "20 question with ex-Megadeth drummer Nick Menza". Metal Sludge. Archived from the original on November 11, 2013. Retrieved November 15, 2013. ↑ "Nick Menza: "I Was Fired From Megadeth Two Days After Surgery"". RockRage. Blabbermouth.net. February 19, 2002. Retrieved December 10, 2013. ↑ Risk liner notes (2004 reissue). Capitol Records. 2004. pp. 2–5, 9, 11, 13, 15. ↑ Hjelm, Fredrik (2001). "It Wasn't Fun Anymore". Shockwaves Online. Rockmetal.art.pl. Retrieved December 10, 2013. ↑ Stagno, Mike (September 19, 2006). "Megadeth: Risk". Sputnikmusic . Retrieved December 11, 2013. ↑ Huey, Steve. "Risk – Megadeth". AllMusic . Retrieved December 9, 2013. ↑ Plenda, Melanie (July 3, 2013). "Frontman Dave Mustaine talks about reviving thrash-metal sound, getting back into the studio, hitting the road". NewHampshire.com. Archived from the original on December 2, 2013. Retrieved November 22, 2013. ↑ Sciarretto, Amy (January 31, 2000). "Loud Rock News". CMJ New Music Report . 61: 35. Retrieved March 28, 2014. ↑ "Megadeth's Mustaine Raring To "Crush 'Em"". MTV. June 23, 1999. Retrieved December 11, 2013. ↑ MTV News staff (July 23, 1999). "Original Megadeth Drummer Samuelson Dead At 41". MTV . Retrieved July 16, 2014. ↑ Rosen 2011, p. 92. ↑ Saidman, Sorelle (January 10, 2000). "Megadeth Guitarist Marty Friedman Leaves Band". MTV . Retrieved December 12, 2013. ↑ Prato, Greg (July 29, 2009). "Megadeth's Dave Mustaine Talks New Riffs, Old Drama". Rolling Stone . Retrieved December 15, 2013. ↑ Newman, Melinda (January 22, 2000). "The Beat". Billboard : 18. Retrieved December 12, 2012. 1 2 Metal Sludge staff (September 4, 2001). "23 Questions With Dave Mustaine". Metal Sludge. Archived from the original on December 13, 2013. Retrieved December 10, 2013. ↑ Ellefson & McIver 2013, p. 136. 1 2 3 Baird, Kirk (September 14, 2001). "Acerbic Mustaine explains Megadeth's metal issues". Las Vegas Sun . Retrieved December 7, 2013. ↑ Huey, Steve. "Capitol Punishment: The Megadeth Years". AllMusic . Retrieved December 5, 2013. ↑ Huey, Steve. "Megadeth: The World Needs A Hero". AllMusic . Retrieved December 7, 2013. ↑ "Megadeth Completes 'Hero'". Billboard . January 22, 2001. Retrieved December 7, 2013. 1 2 Chandrasekhar, Chaitra (May 15, 2001). "Back to their Metallic Roots". The Tech . 121 (26). Retrieved December 7, 2013. 1 2 "Metal Returns: Megadeth, Halford, Slayer". Billboard . February 20, 2001. Retrieved December 7, 2013. 1 2 "Fans To Choose Set Lists For U.S. Megadeth Trek". Billboard . August 6, 2001. Retrieved December 7, 2013. ↑ Brackett, Nathan; Hoard, Christian David, eds. (2004). The New Rolling Stone Album Guide . Simon & Schuster. p. 534. ISBN 0-7432-0169-8. 1 2 "Megadeth – Chart History (Songs)". Billboard . Retrieved December 4, 2013. ↑ Ellefson & McIver 2013, p. 139. ↑ Ellefson & McIver 2013, p. 218. ↑ Wiederhorn, Jon (March 2, 2004). "Megadeth Pack It In After Nearly 20 Years". MTV . Retrieved May 19, 2014. ↑ "Injury Forces Mustaine To Disband Megadeth". Billboard . April 3, 2002. Retrieved November 25, 2013. ↑ "Megadeth to split up". BBC News. April 4, 2002. Retrieved January 21, 2014. ↑ Epstein, Dan (August 2003). "Die Another Day". Guitar World . Rockmetal.art.pl. Retrieved November 25, 2013. ↑ Torreano, Bradley. "Megadeth: Still, Alive...and Well?". AllMusic . Retrieved December 5, 2013. ↑ "Dave Mustaine: 'I Am And Always Will Be Megadeth'". Blabbermouth.net. July 12, 2003. Retrieved November 25, 2013. ↑ Ayers, Chris (March 2005). "Megadeth: Remixed and Remastered Series". Exclaim! . Retrieved December 13, 2013. ↑ Wiederhorn, Jon (September 10, 2004). "Dave Mustaine, Megadeth Return To Life With New System". MTV . Retrieved May 19, 2014. ↑ Nalbandian, Bob (August 28, 2004). "Dave Mustaine Interview". Hard Radio. Retrieved November 19, 2006. ↑ "Megadeth's Mustaine Says Nick Menza Wasn't Prepared To Tour With The Band". Blabbermouth.net. November 16, 2004. Retrieved December 3, 2013. ↑ Gitter, Mike (October 24, 2012). "Where Are They Now? Chris Poland of Megadeth". Noisecreep . Retrieved December 3, 2013. ↑ Dizon, Joey (July 7, 2012). "A Life of 'Deth". The Philippine Star . Retrieved July 17, 2014. ↑ Sciarretto, Amy (September 13, 2004). "Genre Focus – Megadeth; The System Has Failed". CMJ New Music Report : 22. Retrieved November 22, 2013. ↑ "Dave Mustaine Discusses Going Solo, Dimebag, Kerry King And Metallica". Blabbermouth.net. February 11, 2005. Retrieved December 4, 2013. ↑ "Megadeth Tour Manager Talks About Drummer Nick Menza's Departure". Brave Words & Bloody Knuckles . November 5, 2004. Retrieved December 4, 2013. ↑ "Updated: Exodus Added To More Dates On Megadeth's U.S. Tour". Blabbermouth.net. October 16, 2004. Retrieved December 4, 2013. ↑ "Diamond Head To Support Megadeth In Europe". Blabbermouth.net. December 30, 2004. Retrieved December 4, 2013. ↑ Begrand, Adrien (July 28, 2005). "Megadeth: Greatest Hits: Back to the Start". Popmatters . Retrieved December 3, 2013. ↑ Bowar, Chad (October 1, 2006). "Gigantour DVD Review". About.com . Retrieved July 16, 2014. ↑ "Megadeth Will Continue". Ultimate-Guitar.com. October 10, 2005. Retrieved December 4, 2013. ↑ Prato, Greg (March 27, 2007). "Megadeth: That One Night: Live in Buenos Aires". AllMusic . Retrieved December 4, 2013. ↑ "Ex-Megadeth Bassist MacDonough: 'There Is No Animosity Here'". Blabbermouth.net. February 20, 2006. Retrieved December 4, 2013. ↑ "Megadeth bassist James Lomenzo joins Yamaha Guitars". Yamaha Corporation. January 25, 2008. Retrieved December 4, 2013. ↑ "Megadeth Play First Show With Bassist James LoMenzo". Blabbermouth.net. March 18, 2006. Retrieved December 4, 2013. ↑ Bowar, Chad (March 21, 2006). "Megadeth – Arsenal Of Megadeth DVD". About.com . Retrieved December 4, 2013. ↑ "Gigantour 2006 Announced: Megadeth, Lamb of God, Opeth, Arch Enemy, Overkill Confirmed". Blabbermouth.net. July 23, 2006. Retrieved December 4, 2013. ↑ "Gigantour 2006 – Australian Mini-Tour". Brave Words & Bloody Knuckles . November 10, 2006. Retrieved December 4, 2013. ↑ "Megadeth: New Album Pushed Back To 2007". Blabbermouth.net. August 23, 2006. Retrieved November 25, 2013. ↑ "Megadeth: 'United Abominations' To Be Released In May". Blabbermouth.net. January 21, 2007. Retrieved November 28, 2013. 1 2 "Megadeth's New Version Of 'A Tout Le Monde' To Feature Lacuna Coil's Scabbia". Blabbermouth.net. March 3, 2007. Retrieved November 26, 2013. ↑ Hasty, Katie (May 23, 2007). "Linkin Park Scores Year's Best Debut With 'Midnight'". Billboard . Retrieved November 26, 2013. ↑ Freeman, John (May 3, 2007). "Heaven and Hell (Black Sabbath), Megadeth, Machine Head". Dallas Observer . Retrieved November 26, 2013. ↑ Kilgore, Kym (July 10, 2007). "Megadeth's 'Tour of Duty'". Sound Spike. Archived from the original on December 3, 2013. Retrieved November 27, 2013. ↑ "Megadeth, Static-X, DevilDriver, Lacuna Coil Team Up For Australia's Gigantour". Blabbermouth.net. August 8, 2007. Retrieved November 28, 2013. ↑ Dodgin, Rich (October 31, 2013). "Interview with Glen Drover". All About the Rock. Retrieved November 26, 2013. ↑ Laing, Robert (January 8, 2008). "Rumour: Megadeth to recruit new guitarist". MusicRadar . Retrieved November 29, 2013. ↑ Aledort, Andy (June 13, 2013). "Interview: Megadeth's Chris Broderick Talks Technique". Guitar World . Retrieved November 29, 2013. ↑ Bezer, Terry (March 9, 2009). "Megadeth's Dave Mustaine: Broderick Is 'Best Guitarist Megadeth Has Ever Had'". Metal Hammer . Archived from the original on December 3, 2013. Retrieved November 29, 2013. ↑ "Nevermore drummer: Megadeth is getting "One Hell Of A Good Player, Great Guy And True Friend"". Blabbermouth.net. January 16, 2008. Retrieved November 29, 2013. ↑ Guitar World staff (January 14, 2008). "Dave Mustaine Announces Gigantour 2008 & New Guitarist". Guitar World . Retrieved July 5, 2014. ↑ Ratliff, Ben (April 24, 2008). "Thrash Times Five When Bands Convene". The New York Times . Retrieved November 28, 2013. ↑ Bowar, Chad (September 30, 2008). "Megadeth – Anthology: Set The World Afire". About.com . Retrieved November 28, 2013. ↑ "'Priest Feast' Featuring Judas Priest, Megadeth, Testament: Dutch Date Added". Blabbermouth.net. October 29, 2008. Retrieved November 19, 2013. ↑ "Dave Mustaine to Metallica: I Am So Very Proud of All You Have Accomplished". Blabbermouth.net. February 27, 2009. Retrieved November 19, 2013. ↑ "Megadeth And Slayer To Co-Headline 'Canadian Carnage' Trek". Blabbermouth.net. April 27, 2009. Retrieved November 19, 2013. ↑ Bezer, Terry (June 19, 2009). "Megadeth Reveal More About New Album". Metal Hammer . Archived from the original on December 15, 2013. Retrieved November 19, 2013. ↑ Bezer, Terry (July 27, 2009). "Megadeth 'Endgame' Track-By-Track Preview". Metal Hammer . Archived from the original on August 15, 2009. Retrieved November 19, 2013. ↑ Buchanan, David (September 15, 2009). "Megadeth brings Endgame to life, tours North America". Consequence of Sound . Retrieved November 19, 2013. ↑ "Slayer, Megadeth, Testament: Complete 'American Carnage' Details Revealed". Blabbermouth.net. November 16, 2009. Retrieved November 19, 2013. ↑ "Megadeth's "Head Crusher" Nominated For a Grammy". Roadrunner Records. July 12, 2011. Retrieved November 19, 2013. ↑ Guitar World staff (January 25, 2010). "Megadeth Announce 'Rust In Peace' 20th Anniversary Tour Dates". Guitar World . Retrieved November 19, 2013. ↑ Dome, Malcolm (February 9, 2010). "David Ellefson Exclusive: Why I'm Back In Megadeth". Classic Rock . Archived from the original on November 1, 2013. Retrieved November 19, 2013. ↑ MusicRadar staff (December 15, 2009). "Thrash metal's 'Big Four' for Sonisphere 2010!". MusicRadar . Retrieved November 20, 2013. ↑ Paine, Andre (June 10, 2010). "Metallica Heading To Cinemas". Billboard . Retrieved November 20, 2013. ↑ Downey, Ryan J. (April 25, 2011). "Metallica, Megadeth, Slayer And Anthrax Make Big 4 History". MTV . Retrieved November 20, 2013. ↑ Ratliff, Ben (September 15, 2011). "Metallica Earns Its Top Billing of the Big Four". The New York Times . Retrieved November 20, 2013. ↑ Guitar World staff (April 26, 2010). "Slayer to Perform Complete 'Seasons in the Abyss' Album on Upcoming Tour". Guitar World . Retrieved November 20, 2013. ↑ Bezer, Terry (August 20, 2010). "Vic Rattlehead Makes Megadeth Live Debut". Metal Hammer . Archived from the original on April 5, 2013. Retrieved March 6, 2013. ↑ Freedman, Pete (September 30, 2010). "Backstage with Anthrax, Megadeth & Slayer!". Spin . Retrieved November 20, 2013. ↑ Vick, Megan (October 25, 2010). "Slayer's Kerry King Performs with Megadeth". Billboard . Retrieved November 20, 2013. ↑ Debenedictis, Matt (January 31, 2011). "Disturbed, Godsmack, Megadeth Headlining Rockstar Mayhem Festival 2011". Noisecreep . Retrieved November 20, 2013. ↑ Guitar World staff (June 23, 2010). "Megadeth to Release 'Rust In Peace Live' Blu-Ray, DVD and CD". Guitar World . Retrieved November 20, 2013. ↑ East, Thomas (September 1, 2010). "Guitar Hero: Warriors Of Rock Megadeth trailer". Official Nintendo Magazine . Retrieved November 20, 2013. ↑ Harris, Chris (June 4, 2010). "Mustaine Pens Fresh Megadeth Track For 'Guitar Hero'". Rolling Stone . Retrieved November 20, 2013. ↑ Sciarretto, Amy (December 1, 2010). "Grammy Nominees 2011 Announced for Hard Rock and Metal". Noisecreep . Retrieved November 20, 2013. ↑ Graff, Gary (October 31, 2011). "Megadeth's Dave Mustaine: 6 Questions About 'Thirteen'". Billboard . Retrieved November 20, 2013. ↑ Prato, Greg (July 12, 2011). "Dave Mustaine Reveals New Megadeth Album Details". Rolling Stone . Retrieved November 20, 2013. ↑ Bittke, Brett (December 2, 2011). "Megadeth Receives their 10th Grammy Nomination". Screamer magazine . Retrieved November 20, 2013. ↑ Young, Alex (November 1, 2011). "Megadeth, Motorhead, team up for Gigantour 2012". Consequence of Sound . Retrieved November 20, 2013. ↑ MacIntyre, Dave (February 16, 2012). "Gigantour 2012 featuring Lacuna Coil, Volbeat, Motorhead and Megadeth". PopMatters . Retrieved November 20, 2013. ↑ Riddle, Tree (February 21, 2012). "Rob Zombie and Megadeth To Embark on Co-Headlining 2012 U.S. Tour". Loudwire . Retrieved November 20, 2013. ↑ Childers, Chad (September 10, 2012). "Megadeth to Celebrate 20th Anniversary of 'Countdown to Extinction' With Reissue and Fall 2012 Tour". Loudwire . Retrieved November 17, 2013. ↑ Ouellette, Mary (September 21, 2013). "Megadeth Reveal 'Countdown To Extinction: Live' Trailer". Loudwire . Retrieved November 17, 2013. ↑ "Halestorm: "Winning A Grammy Is A Huge Milestone For Us"". Metal Hammer . February 12, 2013. Archived from the original on December 3, 2013. Retrieved November 17, 2013. ↑ "Megadeth Working On 'Dark', 'Heavy' And 'Fast' New Album". Blabbermouth.net. January 28, 2013. Retrieved January 29, 2013. ↑ Hartmann, Graham (February 12, 2013). "Megadeth Announce June Release for Upcoming Album 'Super Collider'". Loudwire . Retrieved February 12, 2013. ↑ Caulfield, Keith (June 12, 2013). "Queens Of The Stone Age Get First No. 1 Album On Billboard 200". Billboard . Retrieved September 28, 2013. ↑ "Super Collider – Megadeth". Metacritic . CBS Interactive . Retrieved June 17, 2013. ↑ Wise, Lauren (November 25, 2013). "Megadeth's Dave Mustaine: There's Been a Renaissance With Us". Phoenix New Times . Retrieved December 16, 2013. ↑ "Megadeth Planning New Album: 'Time Is Short'". Ultimate-Guitar.com. July 24, 2013. Retrieved November 17, 2013. ↑ Hartmann, Graham (May 3, 2013). "Black Label Society Join Lineup for Megadeth's Gigantour 2013 + Dates Announced". Loudwire . Retrieved June 12, 2014. ↑ Bowar, Chad (August 12, 2013). "Megadeth and Jason Newsted Play Metallica's 'Phantom Lord' During Toronto Gigantour Finale". Loudwire . Retrieved June 12, 2014. ↑ Vincent, Peter (February 10, 2014). "Soundwave 2014: Megadeth cancels Australian tour". The Sydney Morning Herald . Retrieved February 15, 2014. ↑ Joyce, Colin (August 5, 2014). "Cee Lo Green and Megadeth Cancel Israel Shows". Spin . Retrieved August 7, 2014. ↑ Leight, Elias (September 10, 2014). "Megadeth Pulls Out of Motorhead's Motorboat Cruise". Billboard . Retrieved September 17, 2014. ↑ Kielty, Martin (November 26, 2014). "Broderick & Drover Quit Megadeth". Classic Rock . Retrieved November 27, 2014. ↑ Kaufman, Spencer (December 2, 2014). "Megadeth's David Ellefson: We Are Not Disbanding". Loudwire . Retrieved December 3, 2014. ↑ Epstein, Dan (July 20, 2015). "Interview: Megadeth's Dave Mustaine Gives Update from the Studio". Revolver . Retrieved July 22, 2015. ↑ Kennedy, Maev (May 22, 2016). "Former Megadeth drummer Nick Menza dies after collapsing on stage". The Guardian . Retrieved July 15, 2016. ↑ "Meet Megadeth's New Guitarist: Kiko Loureiro of Angra". Guitar World . April 2, 2015. Retrieved April 6, 2015. ↑ Bienstock, Richard (October 1, 2015). "Megadeth Premiere New Song, "Fatal Illusion"". Revolver . Retrieved October 2, 2015. ↑ Childers, Chad (July 14, 2016). "Megadeth Officially Confirm Dirk Verbeuren as New Drummer". Loudwire . Retrieved July 15, 2016. ↑ "Megadeth's Dave Mustaine calls for 2017 Big Four tour". Metal Hammer. December 6, 2016. Retrieved December 7, 2016. ↑ "Chris Adler". The Grammys. Archived from the original on February 22, 2017. Retrieved February 20, 2017. ↑ Teitelman, Bram (February 19, 2017). "Megadeth's Dave Mustaine Reflects on First Grammy Win, House Band Playing Metallica". Billboard . Retrieved February 20, 2017. ↑ "'KILLING IS MY BUSINESS...AND BUSINESS IS GOOD: THE FINAL KILL' DELUXE REISSUE!". ↑ "MEGADETH Announces First-Ever 'Megacruise'". Blabbermouth. September 25, 2018. Retrieved October 11, 2018. ↑ "Overkill and Dragonforce added to first-ever MegaCruise". metalinsider.net. October 25, 2018. Retrieved October 28, 2018. ↑ "Dave Mustaine Teases Heavy + Fast New Megadeth Song – Listen". Loudwire. Retrieved November 8, 2018. ↑ "Megadeth share rehearsal footage from new album sessions". Metal Hammer Magazine. Retrieved November 8, 2018. ↑ Crawford, Allyson B. (April 5, 2012). "Megadeth Frontman Dave Mustaine's Most Controversial Quotes". Noisecreep . Retrieved November 21, 2013. ↑ Hartmann, Graham (August 31, 2012). "Metallica vs. Dave Mustaine – Nastiest Rock Feuds". Loudwire . Retrieved November 21, 2013. ↑ Hay, Carla (January 17, 2004). ""Monster" Film Reveals Metallica's Dynamics". Billboard . 116: 15. Retrieved November 21, 2013. ↑ Wiederhorn, Jon (July 20, 2004). "Megadeth Frontman, Filmmakers At Odds Over Metallica Doc". MTV . Retrieved November 21, 2013. ↑ Herzog, Kenny (July 18, 2011). "Dave Mustaine Interview". The A.V. Club . Retrieved June 4, 2014. ↑ "Holy Wars...The Punishment Due". Rolling Stone . Archived from the original on March 9, 2014. Retrieved December 6, 2013. ↑ Mann, Laura (August 1, 2011). "The Ten Best Music Videos Banned by MTV". Dallas Observer . Retrieved November 22, 2013. ↑ Pessin, Anna Lisa (October 1992). "Dressed for Success". Spin . 8: 52. Retrieved September 20, 2013. ↑ Jeckell, Barry A. (August 6, 2001). "Billboard Bits: LL Cool J, Megadeth, Money Mark". Billboard . Retrieved December 13, 2013. ↑ "'Hero' Takes A Fall In Malaysia". New Musical Express . July 24, 2001. Retrieved December 13, 2013. ↑ Stroumboulopoulos, George. "Interview: Dave Mustaine". CBS . Retrieved November 22, 2013. ↑ Prince, Patrick (June 13, 2011). "Dave Mustaine at 'Peace' in his career, 25 years later". Goldmine . Retrieved November 22, 2013. ↑ Kerby, Jeff (July 24, 2005). "Dave Mustaine Speaks to KNAC.com From Gigantour". KNAC.com . Retrieved November 22, 2013. ↑ "Megadeth Founders Exchange Lawsuits". Billboard . August 9, 2004. Retrieved November 22, 2013. ↑ "Megadeth's Mustaine Sues Former Bassist". Billboard . July 26, 2005. Retrieved June 4, 2014. ↑ Wiederhorn, Jon (February 10, 2010). "Megadeth Frontman Extends Olive Branch to Original Bassist". Noisecreep . Retrieved November 22, 2013. ↑ Grow, Kory (August 3, 2010). "Exclusive Excerpt From Dave Mustaine's Autobiography: Meeting Lars Ulrich". Revolver. NewBay Media. Archived from the original on November 20, 2015. ↑ Smyers, Darryl (March 1, 2012). "Megadeth's Dave Ellefson Talks About Christianity and Lady Gaga". Dallas Observer . Retrieved November 23, 2013. ↑ Full Metal Jackie (October 7, 2013). "Megadeth Frontman Dave Mustaine on Touring With Iron Maiden, Social Media + More". Loudwire . Retrieved November 23, 2013. ↑ Edmondson 2013, p. 147. ↑ Dika 2012, p. 188. ↑ Bivins 2008, p. 74. ↑ Carney, Christine (September 18, 2007). "Megadeth's Mustaine Talks About Albums That Influenced Him;". MP3.com . Blabbermouth.net . Retrieved November 26, 2013. ↑ Sharken, Lisa (January 9, 2007). "Dave Mustaine of Megadeth". Seymour Duncan. Retrieved December 3, 2013. ↑ Bosso, Joe (December 14, 2011). "Interview: Megadeth's Dave Mustaine talks Thirteen, Metallica and riffs". MusicRadar . Retrieved December 3, 2013. 1 2 Toto, Anthony (November 29, 2013). "Interview: Megadeth". Pop-Break. Archived from the original on December 10, 2013. Retrieved December 7, 2013. ↑ Wise, Lauren (October 28, 2013). "Megadeth's Dave Ellefson: "All The Best Things In My Life Were Not My Idea"". Phoenix New Times . Retrieved December 16, 2013. ↑ Chamberlain, Rich (June 3, 2013). "Dave Mustaine on Super Collider, Endgame, Risk and more". MusicRadar . Retrieved July 11, 2014. ↑ Ruggiero, Bob (December 11, 2013). "Megadeth's Dave Mustaine Hopes You're Still Buying". Houston Press . Retrieved December 15, 2013. 1 2 Purcell 2003, p. 53. ↑ "Megadeth Biography". Rolling Stone . Simon & Schuster. 2001. Retrieved November 22, 2013. ↑ Bienstock, Richard (January 17, 2013). "Interview: Megadeth Guitarist Dave Mustaine on 2009's 'Endgame'". Guitar World . Retrieved December 15, 2013. ↑ Sciaky, Davide (August 17, 2017). "Interview: Megadeth (David Ellefson)". TrueMetal.it . Retrieved January 14, 2018. ↑ Wagner 2010, p. 43. ↑ Michael Moses, Dan Kaye (June 5, 1999). "What Did You Do In The War, Daddy?". Billboard : 12. Retrieved November 22, 2013. ↑ Arnett 1996, p. 44. ↑ Powell, Mike (September 2011). "Diggin' In the Crates For Untold Treasures". Spin . 27: 92. Retrieved November 21, 2013. ↑ Taylor, Chuck (November 29, 1997). "Metal Mainstay Megadeth Alters Its Lyrics But Not Its Music For The '90s". Billboard : 74. Retrieved November 21, 2013. ↑ Phillips & Cogan 2009, p. 157. ↑ Edmondson 2013, p. 49. ↑ Thompson 2007, p. 135. ↑ Phillips & Cogan 2009, p. 210. ↑ Rivadavia, Eduardo (August 15, 2013). "10 Best Thrash Metal Bands of All Time". Loudwire . Retrieved November 24, 2013. ↑ CMJ Network, Inc (February 11, 2002). "Loud Rock". CMJ New Music Report : 45. Retrieved November 24, 2013. ↑ Paoletta, Michael (August 14, 2004). "Vital Reissues". Billboard : 45. Retrieved November 24, 2013. ↑ Wiederhorn, Jon. "Greatest Metal Bands – Honorable Mentions". MTV. Archived from the original on October 21, 2013. Retrieved November 24, 2013. ↑ Kahn-Harris 2007, p. 132. ↑ Ramirez, Carlos (July 29, 2009). "Top 10 New School Thrash Bands". Noisecreep . Retrieved December 13, 2013. ↑ "Warbringer: 'Hunter-Seeker' Lyric Video Released". Blabbermouth.net. September 17, 2013. Retrieved December 13, 2013. ↑ Gensler, Andy (June 3, 2014). "How Marty Friedman Went From Megadeth to the 'Ryan Seacrest Of Japan'". Billboard . Retrieved June 5, 2014. ↑ "Megadeth 'Countdown to Extinction: Live' To Be Released Worldwide on September 24". Business Wire. August 28, 2013. Retrieved December 26, 2013. ↑ Loudwire staff (January 2, 2012). "Megadeth Win Two 2011 Loudwire Music Awards". Loudwire . Retrieved December 29, 2013. ↑ "Metal Hammer Golden Gods Awards: Complete List of Winners". Blabbermouth.net. June 17, 2008. Retrieved March 8, 2009. ↑ Carman, Keith (April 8, 2009). "Isis, Metallica, Slipknot Winners At the Epiphone Revolver Golden Gods Awards". Exclaim! . Retrieved April 10, 2009. Bivins, Jason C. (2008). Religion of Fear: The Politics of Horror in Conservative Evangelicalism. Oxford University Press. ISBN 978-0-19-988769-9. Bukszpan, Daniel (2003). The Encyclopedia of Heavy Metal. Barnes & Noble. ISBN 0-7607-4218-9. Dika, Vera (2012). The (Moving) Pictures Generation: The Cinematic Impulse in Downtown New York Art and Film. Palgrave Macmillan. ISBN 978-1-137-11851-6. Edmondson, Jacqueline (2013). Music in American Life: An Encyclopedia of the Songs, Styles, Stars, and Stories That Shaped Our Culture. ABC-CLIO. ISBN 0-313-39348-6. Ellefson, David; McIver, Joel, eds. (2013). My Life with Deth: Discovering Meaning in a Life of Rock & Roll. Simon & Schuster. ISBN 1-4516-9988-3. Gulla, Bob (2009). Guitar Gods: The 25 Players who Made Rock History. ABC-CLIO. ISBN 0-313-35806-0. Harrison, Thomas (2011). Music of the 1980s. ABC-CLIO. ISBN 0-313-36599-7. Janosik, Mary Ann (2006). The Greenwood Encyclopedia of Rock History: The video generation, 1981–1990. Greenwood Press. ISBN 0-313-32943-5. Joyner, David Lee (2002). American popular music. McGraw-Hill Higher Education. ISBN 0-07-241424-3. Kahn-Harris, Keith (2007). Extreme Metal: Music and Culture on the Edge. Berg Publishers. ISBN 1-84520-399-2. Kajzer, Jackie; Lotring, Roger, eds. (2010). Full Metal Jackie Certified: The 50 Most Influential Metal Songs of the '80s. Cengage Learning. ISBN 1-4354-5569-X. Konow, David (2009). Bang Your Head: The Rise and Fall of Heavy Metal. Crown Publishing Group. ISBN 0-307-56560-2. Larkin, Colin (1995). The Guinness Encyclopedia of Popular Music: Lincoln, Abe-Primettes . Guinness Publishing. ISBN 1-56159-176-9. Moore, Ryan (2009). Sells like Teen Spirit: Music, Youth Culture, and Social Crisis. NYU Press. ISBN 0-8147-9603-6. Mustaine, Dave (2010). Mustaine: A Life in Metal. New York, New York, USA: Harper Collins. ISBN 0-00-732410-3. Mustaine, Dave (2011). Mustaine: A Heavy Metal Memoir. New York, New York, USA: Harper Collins. ISBN 0-06-171437-2. Phillips, William; Cogan, Brian, eds. (2009). Encyclopedia of heavy metal music. Greenwood Press. ISBN 0-313-34800-6. Pillsbury, Glenn (2006). Damage Incorporated: Metallica and the Production of Musical Identity. Routledge. ISBN 0-415-97373-2. Popoff, Martin (2002). The Top 500 Heavy Metal Songs of All Time. ECW Press. ISBN 978-1-55022-530-3. Prown, Pete; Newquist, Harvey P., eds. (1997). Legends of Rock Guitar: The Essential Reference of Rock's Greatest Guitarists. Hal Leonard Corporation. ISBN 0-7935-4042-9. Purcell, Natalie J. (2003). Death Metal Music: The Passion and Politics of a Subculture. McFarland. ISBN 0-7864-8406-3. Rees, Dafydd; Crampton, Luke, eds. (1999). Rock stars encyclopedia. DK Publishing. ISBN 0-7894-4613-8. Rosen, Steven (2011). Black Sabbath – Uncensored On the Record. Coda Books Ltd. ISBN 1-908538-85-6. Rubiner, Julia (1993). Contemporary Musicians: Profiles of the People in Music. Gale Group. ISBN 0-8103-2217-X. Talevski, Nick (2010). Rock Obituaries – Knocking On Heaven's Door. Omnibus Press. ISBN 0-85712-117-0. Tarquin, Brian (2012). Recording Techniques of the Guitar Masters. Cengage Learning. ISBN 1-4354-6017-0. Unterberger, Richie; Hicks, Samb, eds. (1999). Music USA: The Rough Guide. Rough Guides. ISBN 1-85828-421-X. Wagner, Jeff (2010). Mean Deviation: Four Decades of Progressive Heavy Metal . Bazillion Points Books. ISBN 0-9796163-3-6. 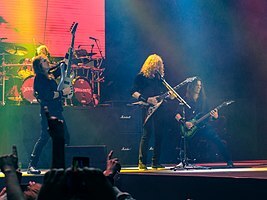 Wikimedia Commons has media related to Megadeth .